Well this gave a whole new meaning to the old saying "Highway Robbery". On the main Highway (heading north) almost at the turnoff to Tom Price is a Roadhouse called 'Nanutarra'. We had been warned by plenty of travelers that this place is expensive but we certainly didn't expect this. Firstly the fuel was the most expensive we have seen yet. Even on the Nullarbor the dearest diesel was only $1.70/litre compared to this place at $186.9 cents / litre. We worked out exactly how much diesel we needed to get to Tom Price and that was all we bought. As it was close to lunch time we stayed at the roadhouse and had something to eat in the van. In that 15 minutes we saw most cars pull up, look at the price and drive off. The only people who paid this ludicrous price were those who had no other choice. Even in Tom Price which is 355kms inland we only paid $153.5 cents/litre. That is 33.4 cents /litre cheaper. While we were having lunch a car towing a nice boat pulled in next to us. One guy went into the roadhouse and the other guy waited near his car. The guy that waited was laughing so much I thought he was going to wet himself. The day prior they had made a bet on the footy with the wager being a can of Bundy and coke. The guy doing all the laughing had won the bet and decided he wanted his prize right now at Nanutarra. The other guy came out of the roadhouse shaking his head. One can of 'Bundy Rum and coke' cost him $10-00. His mate thought it was hysterical and said he would never drink it, but keep it as a souvenir. Nice mate. The locals told us that according to the truckies this is the most expensive roadhouse in Australia . They should know. Some other prices -LPG gas was $1-00 litre, $5-20 for a bucket of hot chips, $2-50 for a Billabong ice cream, $3-35 for a small packet of chips and $27-00 for 2 hamburgers. The list goes on. That is extortion. My advice, if coming through this way is to keep going. On our way to the big Tom we had an overnighter at a roadside stop called 'Beasley River'. Off the road a few hundred metres and near the Beasley River it was a great stopover. 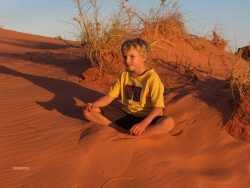 We camped near another family from SA with a couple of young boys. I am sure we will bump into them again. Next stop Tom Price for an overnighter then onto Karijini Nat Park (formerly known as Hammersley Range Nat park). Now the town of Tom Price was a pleasant surprise. It is one of those places that has a good feel about it the minute you drive in. It is only small but has a good range of shops including a big 'Coles'. The town has nice parks and gardens and was very green due to all the recent rains. The people were all friendly and the caravan park was nice, complete with grass. Now here is a statement. I could happily live here for a few years. This place has a very young population with half the population being children. This little town of 4,000 people has two primary schools and one high school. True story. On arrival in town (early-ish) we hit the Tourist Info centre and booked the mine tour for the following morning, had a good look around, shopped, washed and drove up to Mount Nameless, which was a spectacular backdrop to the caravan park and had great views of the mine, town and surrounding area. The next morning we packed up the van and headed off to town to do the mine tour. Well, it must have been us and 1/2 the caravan park that had the same idea as we were van number 8 parked down the road. Following the mine tour we will be off to Karijini National Park. The tour was excellent and although we have done a couple of mine tours already this is our first actually down into an open cut mine. This mine is the only reason for Tom Price's existence and was originally a closed town owned and operated completely by the mine. This area has one of the largest iron ore deposits in the world. Here are a few facts we found interesting: Hammersley Iron runs the mine and is owned by Rio Tinto. All the iron ore is sent to Dampier via rail and exported. Over 50% of all Australian iron ore is exported to China with the remainder going to Europe and Sth East Asia. The Chinese industrial boom has driven the price of the ore through the roof with the price being paid increasing by over 90% in the past two years. Over 3,000 people are employed by this mine alone, including fly in, fly out contractors. All staff at the mine work 3 day shifts, 3 night shifts and then 6 days off. They also receive 6 weeks annual leave which means they actually work 4 1/2 months a year. On top of being very well paid (minimum wage over $100,00 a year) they also get subsidized rent. Rent ranges from $120 to $150 a MONTH for the workers and $250 a MONTH for management which includes a pool. Electricity supplied FREE and annual airfares included in some packages. 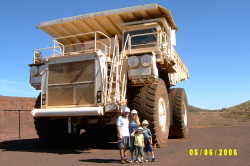 The big mine dump trucks hold 5,000 litres of diesel and use 20 litres per km. They are refueled every 24 hours. Each tyre on these trucks cost $35,000 and are changed every 5 months on average. Last financial year this mine grossed $2 billion with a net profit of $350 million. Multiply that by all the mines they operate and you have a lot of money. They predict the life expectancy of this mine to be 25 years or more. Straight after the tour we set off for Karijini National Park. This National Park is very spread out with a camping ground at each end of the park. We stayed at 'Dales campground' as we were planning to see Wayne and Tracey there and because it is cheaper with a better location than Savannah campground. Let me start by telling you this. In my short lifetime I have visited a lot of National Parks. This particular one is without a doubt one of the best we have seen. It is in the middle of nowhere and a bit of a detour (nearly 600kms) off the road north or south, but is a place you must get to before you die. Words, photos and video footage can not, and do not ,do this place justice. This is an exceptional part of Australia. When we stayed in Perth with Mick and Kaz we were going through our map of WA and they were telling us places we should visit. On our map Mick circled around Karijini NP and simply wrote "GO". Great advice guys. We owe you one because when you are looking at the map and planning the next leg of a journey, it would be easy to say 'we'll give it a miss' or 'we'll do it next time' due to the distance you do need to detour. That would have been a mistake. When we arrived and found the camp host, there on the notice board outside was written 'Parfitt site 18'. Wayne and Tracey had found us a nice site and had reserved it for us. It was good to see them yet again. A familiar face while on the road is one of those special treats. As I said earlier this is a very large National Park and is basically divided into two main sections with the Information Centre somewhere in the middle. 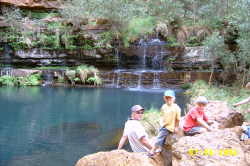 At our end of the park was Dales Gorge with Circular pool, Fortescue Falls and Fern Pool. At the other end which is about 50 kms away is Hancock, Weano and Kalamina Gorge. They are all outstanding yet very different and I would find it very difficult to choose a favourite. So day one was spent doing Dales Gorge over. This was a good introduction to what lies ahead. This was a fairly easy walk that took a little over 3 hours, swims included. 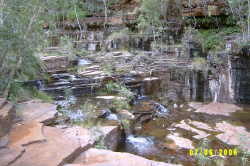 The photos above are of circular pool which was the beginning of the walk. Alex and I had a swim here and the water was refreshing (polite for bloody cold). The water from the small waterfalls that can be seen in the middle photo is warm/ hot artesian water. It was very pleasant and in sharp contrast to the water in the pool below it. The walk is only a couple of kms long but there is a bit of rock climbing involved which slows you down a little. The walk ends at Fortescue Falls that is only a short walk from the camp site, and a good place for a soak after a big day of walking. The next day it was the epic 50 km trip across the other side of the park to see Weano Gorge. 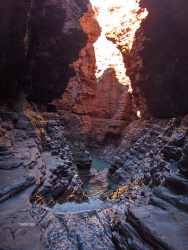 This gorge is a 3 km round trip that ends at 'Handrail Pool'. Once again an extremely interesting, and in places, challenging walk. Handrail pool itself is tricky to get into. It entails stripping off clothes you don't want to get wet, removing the boots and climbing down some rocks and walking along a narrow gorge (about 5 ft wide) that has rapidly running water about a foot deep in it. You then enter a pond about 5 metres in diameter with very steep rock sides. Down another even narrower gorge (just wide enough to walk down) that has a lot of water flowing through. At the end is a metal handrail (hence the name) that you need to hang on to tightly if you don't want to be washed away. Below is Handrail Pool. To get to the pool you need to climb down the rock face using the rope that is tied to the rail. Let me tell you that none of this is easy when you have thousands of litres of very cold water rushing over, around and under you. We all, including Harry got down the rope and into handrail pool. Alex and I (after I had fallen in and wet my only shirt) then swam across the pool, and then swam about 200 metres down this very narrow gorge to Jade Pool . To go any further we need abseiling equipment so for us that was the end of the line. The next major challenge was to get us all back up the rope and then out safely. The next day it was off to the visitors centre which is very good and gives a really good insight to the area and why it is like it is. It was then off to Kalamina Gorge. It's strange because this is the gorge that doesn't get talked about a lot. Maybe it's because it is out on it's own and not clumped together like the others. The camp host even described it as the 'Old Grannies Gorge'. Well they must be pretty agile grannies as we found this not only stunning but also very challenging. The boys, (or should I say the mountain goats) were in their element. This wee walk was about 3 kms return, but once again slow going due to the terrain. This walk would easily be equivalent to an 8 km straight forward walk. Popped in to Joffre Falls lookout on the way home, which was also spectacular due to the recent rains. Will somebody please ring the 'Dept of Families' and report this obvious case of abuse. Child filthy, obviously starving and placed in a highly dangerous situation. Surely this child would be better off sitting in a classroom learning to count or write his name??? The family that we met at Beasley River turned up in our campground so we had drinks with them and planned our next walk.This place is so amazing that you can't get enough of it. So the next day, instead of resting it was off again to the other side of the park to tackle Hancock Gorge with Danny, Tina and their boys. I know you are going to get sick of me saying this but this is another amazing gorge. This was probably the shortest of all the walks we have done but again took us a number of hours due to the terrain. Lots of narrow ledges with very little to grip onto, and deep water a few metres below. At the end of this gorge was the spider walk and Kermits pool that we had heard a lot about. Alex is so keen to try everything and is an amazing little climber with great balance and co-ordination but is still only 8 years old (and bullet proof if you listened to him). I always check out the climbs first and then off he goes. Chris and Harry sat this one out and Danny, me and the boys took off down spider walk. This was heaps of fun, be it a little scary the first time. After we had finished with Hancocks Gorge we took the others over to Handrail and did it all again. Alex was the real little tour guide showing them all the tricks of the trade. As well as the gorges there are a number of spectacular lookouts which don't require as much exertion, but give you an overall idea of the vastness and sheer size of the gorges. Well unfortunately that was it for Karijini. We took hundreds of photos and miles of video, none of which really do it justice. This really has been one of the highlights of the trip so far and a very, very special part of this superb country. To see it with so much water was a bonus and made it even more memorable. Once again lady luck was on our side. And it's badly overdue for a haircut!!!!!!! Even a brush would help. Again we packed up and this time heading for Port Hedland. As it is a fairly long drive we will probably break the trip by staying at Indee Station overnight. We did end up staying at Indee Station and what a spot it was. This is a working cattle station and they also cater for very budget style camping. In a lot of ways it very much reminded us of Hutt River Provence. The guy who owns the place has lived there for over 40 years and is obviously a collector of everything and anything. You basically drive around and find a space between old tractors, car bodies and other junk and set up camp. The camp kitchen was fairly flash, be it a little grubby and the toilet block, well that is a story on it's own. First you had to get out and light the donkey boiler and wait until the water boiled. The water pressure was great and once stoked up was hot. The two toilets in the men's block had see through curtains as doors and when the main door to the toilet block was opened everybody walking past could see you. Yes, it was very basic but cleanish and fun. Chris said the female toilet block was more upmarket and actually had doors on the toilet and shower cubicles (with a sea theme no less!!). At 6-00pm every night, everybody is invited into the Homestead for 'Happy Hour' with food supplied by Betty and Colin, the property owners. These guys really open up their home and hearts to all travelers. They even let me plug in the laptop to their phone line so I could update the web page and check emails. All this for the grand total of $12-00 per night per family. Bargain. The night we stayed there were about 6 other vans all staying a few days. You can even stay rent free if you get out and do a few jobs if you so desire. Well this place was not at all what we had expected. It's funny how you have a pre-conceived idea of a place. In my case it is not often accurate. Well I expected Port Hedland to be a tropical little paradise, green and luscious with lots of shops and plenty to see and do. Don't ask me why I thought that. Ok, now for the reality. Port Hedland is brown, all brown. In fact everything is brown. The dust from BHP literally covers everything. The locals call it Pilbara Pink. I'm not sure where the pink thing comes from, because from where we were sitting it looked very brown. Now for the tropical paradise. It's about as tropical as the Antarctic and as green as a brown cow. OK, so the shopping must be great. Wrong again. The shopping is hopeless. There is a Coles and Woolworths but that is about it. There is no main street to talk of, but there are 2 small shopping complexes. One is in Port Hedland with the other in South Hedland, about 15 kms apart. Most of the shops in the centres are closed and as for the rest, well!! So what about all the sights. Well, we did a great tour of the BHP Billiton Iron Ore shipping facility. The tour took a couple of hours and was really interesting. Alex and Harry loved it all, especially all the big machinery and trains. 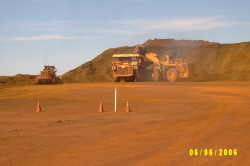 We have now done the iron ore thing from start to finish. We have been to an iron ore mine in Tom Price, have been to steel works in Whyalla and now the shipping facility here in Port Hedland. We ended up spending 3 nights here, not because we really wanted to but because we were waiting for a replacement DVD drive to arrive from Dell (as ours died while in Karijini) and because we had a number of jobs to do. Well the DVD didn't arrive so we left anyway. Hopefully it will get forwarded to Broome. I must say that the service we have received from Dell has been outstanding. I have never had such good after sales service ever. What will our next computer be- A Dell, no question. So what else did we get up to. 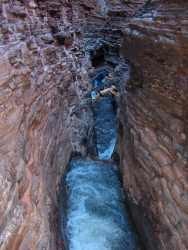 We soaked and washed clothes for nearly 2 days trying to get the Karijini dirt out of everything. I changed the engine oil in the car and rotated the tyres. All fun stuff. Now one monthly event that did coincide with our stay (no, not that one!!) was the 'Stairway to the Moon'. This is an optical illusion that occurs during a full moon between April and October. The full moon rising over the mud flats at low tide gives the illusion of stairs going up to the moon. We went to the beach along with half the town and did witness this natural phenonemon. To really see it properly one either needs a good imagination or preferably be tripping on LSD to get the full benefit. No, it was good and we are glad we saw it . We met one couple who chose not to go to Karijini so that they could see the stairway to the moon instead. That was a very bad call. Each to their own. We did a grocery shop and during the big event I went into the Harvey Norman that was in the same shopping centre. While I was poking around I found a big box of items on the floor at give away prices. In the box I found 2 in-car kits for our digital phones and one for our CDMA phone. What was the chance of that? And for the best part, they were only $1-00 each. True story. For the total sum of $3-00 I bought 3 in-car mobile phone kits. Now that is a bargain. I also dropped into 'Skill' employment agency that was next door to Harvey Norman to see what sort of work was available. As with most places in the west the answer was plenty. The lady told me the biggest shortage in town was for hospital staff, nurses in particular. They are currently offering packages for nurses of over $70-00 per hour with a FREE house included. All good if you like brown!! We're out of here- next stop will be Cape Keraudren for a few well earned days of R&R. (been working our guts out!). 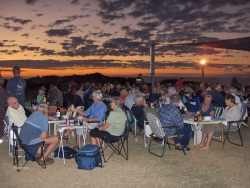 Only 160 km north of Port Hedland is the beginning of 80 Mile Beach. This total length of beach has a number of places that you can stay and enjoy this area. The first is Cape Keraudren. This is a council owned and operated 'Nature Reserve' about 14 kms off the highway on a very corrugated dirt road. We will be staying at 3 different places along this beach but more about the other two later. Within this reserve there are about 6 different areas that you can camp, all on the beach and most with pit toilets. It has an on-site Ranger and really is a very pretty spot and great for fishing, It is fairly expensive at $7.50 per night total for the family (ha! ha!). What great value, good toilets and plenty of them and rubbish collected daily. The view is worth a good million at least. We again bumped into Chris Dempsey's parents and camped next to them. They are lovely people and we had plenty of laughs with them. Our last day was in fact their 40th wedding anniversary so we helped them celebrate that occasion. We ended up having 4 nights here and basically relaxed with Chris and the boys doing journal work. Amongst other things I installed 2 in-car phone kits and am very happy with the result. Finally the dash of the car looks tidy, be it a bit high tech, but tidy. God I love lights and switches. It makes me feel so important. Can't wait for somebody to ring us now. Jon Joiner did ring the other day and was the lucky first to hear it in action. I am sure that made his day. Now speaking of the Joiners, they are about to leave Bundy for an 8 week trip across the top of Australia and we will be meeting up with them somewhere in W.A. That will be fun and we will probably travel with them for a week or three before they start making their way back. Chris's mother Jan is also flying into Broome to spend a week or so with us which will be great. While she is with us we will go north to Cape Leveque to spend a few nights. Jan hasn't been up there before so that will be interesting for all of us. The boys are really excited as is Chris (Oh, and me of course!!) about seeing her. Six months is a long time. Seriously it will be great and we are all looking forward to seeing her again very soon. We could easily have vegged out for a few more days here but must move on. This is the first time this trip that he have had a time frame that we have to stick to. I don't think Jan will be very happy if she arrives in Broome and we aren't there. The next stop will be 80 Mile Beach Caravan Park for a few days and then off to Barn Hill Station. Now the idea of this web page is not to critic every roadhouse we come across but I think this one deserves a mention. At the turn off from the highway to Cape Keraudren is the Pardoo Roadhouse. Exactly like Nanutarra Roadhouse (see Highway Robbery June 06) this place is on the highway. That is where the similarity ends. This roadhouse is absolutely worth visiting. 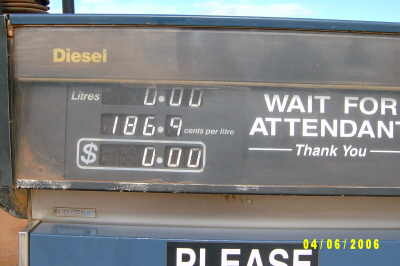 For starters we only paid 169.9 cents a litre compared to 186.9 at Nanutarra. For those a little slow that is a difference of 17 cent/litre and considering this place is a few hundred km north and more remote that makes it well priced. For those camping at Cape Keraudren (and there are heaps) this roadhouse is there only source of fresh drinking water. You would think that they would really have an opportunity to cash in on their precious commodity. Well they don't. In fact they allow you to take as much water as you wish and ask for nothing in return except for a donation to the "Royal Flying Doctor Service". They have raised over $17,000 in the past 18 months. Pretty good effort. They also have a small caravan park attached and unlike most attached to roadhouses this is one really worth staying at. It's a real oasis, with plenty of green grass, shady trees and a pool. So it would seem that this is one little place in the middle of nowhere that is willing to provide a great service as well as making a living. Spread the word, they deserve it. Our next stop only 100 km down the road is the 80 Mile Beach Caravan Park. This is supposedly shell collecting mecca. We had planned just 2 nights here but ended up staying 3 nights instead. The caravan park is a credit to the owners and is grassy, shady and well appointed. The beach is long and beautiful, a little more like QLD beaches. A huge stretch (80 miles in fact) of uninterrupted white sand. Compared to the rest of the WA beaches this is in fact a little boring. Don't get me wrong, it is beautiful, but just lacks the rugged, hostile and raw beauty that we have become accustomed to since being in the west. Nevertheless we are here for shells and hunt for shells we did. It doesn't matter where you look they are everywhere. Millions of them, big ones, little ones, white ones and coloured ones. For somebody who wasn't going to drive their car on the beach we now seem to spend 1/2 our life on the beach. Never in the wet sand or water but up in the soft dry sand. We drove north along the beach for about 20 kms and started the epic search. We found plenty of lovely shells and have added a little more weight to our rig. Not sure what we will do with them all when we get home. Maybe forget about the Post Office or brothel idea and start up a shell shop!!!!! While here we met a lovely couple from Holland, Liz and Curt with their daughter Jackie. 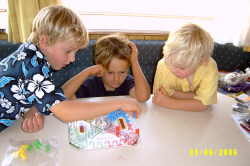 Jackie is the same age as Harry and they played for hours. Harry was a little confused as to why she couldn't understand a single word he said but as with any boy/ girl they managed to overcome the language barrier and have a ball. These guys were lots of fun and we are sure we will catch up with them along the way. We thought we had a lot to organise before embarking on this trip but after talking to them ours was a walk in the park. They had all the domestic issues like renting the house, as well as visa problems and then coming to another country and buying a motorhome and all the necessary day to day gear before setting off. In comparison we had it easy. Anybody in the market for a Winnebago with a queen size bed and double bunks in really good condition can give us a call. They will be away from home for 18 months and are having a ball. Our next stop is a place we have heard so much about and one that we are a little excited about seeing- Barn Hill. It was a fairly boring 250 km drive and we arrived just after lunch. It is funny how you have a mental image of what you think something is going to look like, based on the bits of information you have heard or read. We expected a few gum trees with a couple of vans parked under them with a bowling green overlooking the ocean. We had the bowling green component right but the rest took us by surprise. As we drove in we were confronted by well over a hundred vans scattered around a pleasant well organised area. You might remember that "60 Minutes" did a story on Barn Hill and the grey nomads a year or so back. That really put it on the map. This is a working cattle station of over 500,000 acres and for about 5 months each year the camping section is opened. The outlook over a vibrant red coastline is breathtaking. Not many bowling greens have this magnificent tapestry as their back drop. This is a big call but we all agree that this is a special place. What makes it more interesting is that we can't really put our finger on the reason. It is rustic, even basic, but we have stayed at many places that fit that description. If anything you would have to say it's the atmosphere. We can see why people come and stay here for months. It has a real sense of community and after a few days you even have a sense of belonging. There is Dot's craft corner, where all the ladies gather each morning and do craft, there is the bowling green, where everybody, young and old, male and female get together and have a bowl, a laugh or a lesson. 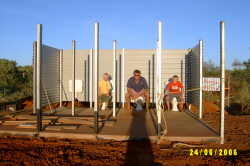 Barn Hill is a work in progress with new toilet blocks being constructed, grass laid and maintenance done. Most of this work is carried out by the grey nomads who give their time for free with no strings attached. For some it gives a sense of worth, while for others it helps fill in the day and they get to enjoy the companionship that goes with the territory. Some were laying tiles, others hanging doors or finishing off the plumbing. Nearly every day a milestone was reached. It might have been as small as another couple of showers being commissioned, but you could feel the excitement, the sense of achievement and you could almost smell the camaraderie. These people were having the time of their life, paying to stay here, working for nothing and loving it. What a place. We could have easily have stayed here a month. The coastline is some of the most spectacular we have seen yet. We again caught up with the 'Dutchies' and again had lots of fun with them. Harry is starting to not even notice that Jackie still doesn't understand a word he says. We all played bowls at least 4 times a day and hate to admit it but Alex beat us nearly every time. There was always somebody willing to give advice to help improve your game. One old lady in particular seemed very knowledgeable and always willing to help out. Turns out she is a very well respected professional bowling coach who helps to get the Australian team ready for the Commonwealth Games. In keeping with the everybody getting in and helping out, the park is even managed by 2 ladies who do an incredible job and get nothing but free rent in return. There is a number of arranged get togethers. Wednesday night is barbecue night. You bring your own tables and food over to the communal grassed area near the bowling green, cook your own food and chat. Then Sunday night is roast night. For the sum total of $12.50 pp you get a 3 course meal. This time you provide everything except for the food. They usually cater for 150 hungry mouths.To see all these people (us included) sitting at their tables, next to total strangers having the time of their life was inspiring. What an experience, what a meal, what a place. This is a place you must visit. Give yourself at least 4 days or even a month. Get involved and enjoy the great sense of this vibrant transient community. We guarantee you will love it and be so much richer for the experience. We had planned to only stay for 3 nights but all the talk about the Sunday roast kept us for another night. We were so glad we did and not only had a huge, beautifully cooked meal but also a great night. At our table there was us, a young couple from the cabin behind us who live in Port Hedland and an old guy (Alan) from a few vans down from us. Alan was an ex Commander of an Australian Naval Destroyer, the Vendetta. He had us all entertained with stories of the high seas, of meeting Royalty, and of the highs and lows of life as a mariner. A number of years ago the ABC did a story on him and his ship on 'Australian Story'. He had a copy of it and after dinner we watched it with him. It was fascinating having him add his commentary to the story. Alex was in awe of meeting a real life Captain of a Destroyer. A lovely guy who I am sure we will keep in touch with. Yet another story and memory from our time on the road. 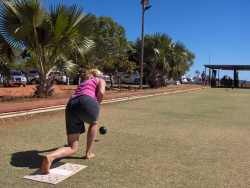 Our next stop is that famous holiday destination for anyone over 55 yrs old, the Cairns of the West, the Pearling Capital of the world, Broome. Will we love it, will we hate it. Only time will tell. There are few places that people on the road talk about as much as Broome. The number one question we are asked is 'Have you booked??' and the look you get when you say 'no' is of total disbelief, of shock and horror. 'You will never get in dear' is the response that will rattle around in my uncluttered mind for the rest of my life. It would seem that 1/2 of WA's retirees and plenty from other states flock here for the winter months. The number of Qld'ers that also make the yearly pilgrimage is staggering. Haven't they heard of Mission Beach, Port Douglas or Cairns?? Same climate and much closer to home. Well apparently not. We arrived at Cable Beach Caravan Park by 8-30am after a very early get away from Barn Hill (120km). I had rung the night before and was told they still had sites and if we arrived early it shouldn't be a problem. Well lady luck was again on our side. We booked straight into a great site close to the toilets under nice shady trees and can stay as long as we wish. Apparently that is unheard of as most people have to change sites 2 or 3 times over a 2 week period if they haven't booked months or even years prior. There is no doubt that it is much quieter this year, I assume due to fuel costs. In previous years we would have never got in. Chris's mum, Jan is flying in on Tuesday for an 8 night stay so we had a few jobs we had to do prior to her arrival. One was to buy a tent and air bed for Chris and I to sleep in while Jan visits, and to be used for those places we can't get the van into. We also had to do shopping and get packed up because on Wednesday morning we are leaving the van and going off to Cape Leveque for 2 days. An esky was also needed, firstly to get all the food up to Cape Leveque and then to use for those times when we will need to leave the van and head bush with the tent. We must have looked at a hundred cheap plastic things that really shouldn't be called eskies. I think the ice would last longer if you laid it out in the sun. We bit the bullet and bought a QLD made 'Tropical Esky'. It's a bright orange thing that we now have to find a place for in the van. More bloody weight. There is no doubt I am the master of organizing. I rang and booked the accommodation for Kooljaman while in Cape Range about a month ago. Cape Leveque is 220km from Broome on a very rough 4x4 only track. It takes at least 3 hours and you feel every inch of the trip. We arrived there just after lunch and went to book in. Yes Mr Parfitt, the receptionist said, you do have a booking but not until the 28th July. Oops. Right date, wrong month. So what do you have available I asked. Nothing sorry, was the reply we really didn't want to hear. 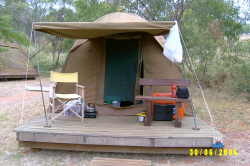 They rang around a few places and got us in for one night at 'Middle Lagoon' only 100 kms back the way we had just come. Kooljaman could then accommodate us for the 2 nights after that but not in the ensuite cabin as planned, but in a permanent dome tent. The upside of going a little more basic was that we could stay for 3 nights all up instead of the 2 we had planned. Our next minor problem was that Middle Lagoon has no linen and guess what, neither did we. Kooljaman Resort were kind enough to lend us all the linen and blankets to take with us. So 100 kms back we go. More bone shaking. Our cabin was actually quite cute sitting up on top of a hill overlooking the lagoon. Cabin might be a slight exaggeration. Our cabin was more like a big bird cage with a tin roof and shade cloth walls. It did have 4 beds and we made up a make shift one on the floor for Alex. We had a small gas burner, a kettle and an open fire outside with a barby plate. That was great as Chris had planned all barbies for our evening meals. Next minor set back was there was no plates, no cups, no cutlery. In fact nothing, and guess what,. we had nothing either. All my hard work and planning going beautifully. I sent Chris off to the office (if you could call it that) to try and sweet talk the old guy. Ah, she hasn't lost her charm and came back shortly after with an old foam box full of all sorts of bits and pieces. All coming together beautifully. I am not sure if I was in the good books with this little effort and the lack of conversation on the subject was deafening. We had a fire, had a great dinner and off to bed. The wind started to blow and continued all night. It was a tad chilly but we all managed to sleep and survive to tell the story. The next morning we had a look around and then set off yet again over the 100 km and 986,253 pot holes back to our original destination. On the way back to Kooljaman we dropped into a couple of indigenous communities. They were all slightly different and the nationality of the missionaries that influenced that community was obvious in the architecture and general surrounds. The next few days were spent doing a bit of exploring and resting. The beaches here are lovely and the sunsets magnificent - another few hundred photos coming up!! The Kooljaman Resort is fairly basic but unspoilt. The coastline is spectacular and reminded us very much of Barn Hill. On Friday we went for a drive to One Arm Point. 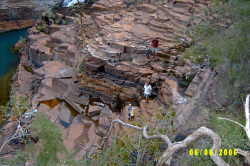 This is another indigenous community at the very top of Cape Leveque. 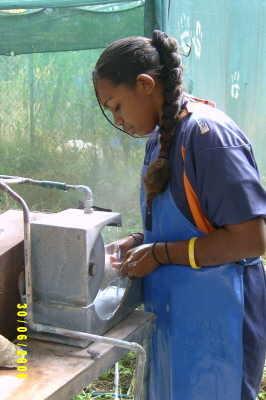 Three days a week the public are invited into the local high school to watch the kids grinding and polishing trochus shells. The shells and jewelery are then sold to raise money for school camps. It was very interesting and we spent well over an hour talking to the staff about the community, and life in such a remote area. Most of the teaching staff are white fellas and on the whole love the people, the lifestyle and the remoteness. They all have big boats and live and breathe fishing. The other industry of interest is the One Arm Point Fish Hatchery. Initially this was set up to breed fish and release them back into the ocean. From what we could gather this still happens. The have also recently branched out into breeding and selling to aquarium shops, 'clown fish' or 'Nemos' as Harry calls them. Since the movie came out the demand for these fish has been very high. In an attempt to stop the ocean stocks of these beautiful fish being depleted they now breed them as well. A number of the large tanks also had barramundi ranging from small to close to a metre long. They were amazing and would have been really yummy. Who needs a fishing rod, we could just stick in our hands and grab one. So that was pretty much it for Cape Leveque. We had an early getaway and headed back to Broome, shake, rattling and rolling over everyone of those corrugations. we made it back in time to go to the much talked about 'Broome Markets'. More on that next month. Stayed tuned for July which will begin with Broome. So that is it for June. Unfortunately that is half way through our trip, but we still have plenty ahead of us. Everything continues to go really well and we can only urge each and everyone of you to consider a trip like this. This is an experience that you cannot put a price on, an experience that this family will never forget, and something that we will talk about and reflect on for many, many years. Don't think for one minute that this will have a negative impact on your kids education. This really is living, it really is learning, the sort of learning they will never get from being in a classroom. A few stats for those interested. We have just completed week 30 on the road. We have now traveled just on 20,000kms and have had 2 flat tyres, both on the caravan (which I plugged and had internally patched later). We have used 3,375 litres of diesel costing $5,100.00. The average diesel cost has been $1.51 per/litre. We remain well under budget on fuel. Our average fuel economy is 17.8 litres/100 km. Our average weekly distance traveled is 667 kms, with our smallest week being 189 kms and our biggest week at 1695 kms. We have spent just over $4,000.00 on accommodation, which is just over half of what we budgeted. We expect to continue to be well ahead on accommodation as we continue to 'free' camp when possible or stay in National Parks. Being self sufficient is crucial doing a trip like this.